Do you like lukewarm tea? Lukewarm coffee? I don’t. Give me my coffee hot or cold, but lukewarm, and I will spew it out of my mouth. Apparently, the way I feel about lukewarm coffee is the way Jesus feels about lukewarm Christianity. In choosing to compare the Laodicean Church with lukewarm water, Jesus probably had in mind the cold and hot water springs located in two nearby cities that were therapeutic and sources of healing and refreshing for their citizens. In contrast, lukewarm water provided no such benefit. Unlike these cold and hot springs, the Laodicean Christians were of no benefit to the people of Laodicea. They may have been saved, though this is questionable, but definitely powerless, like salt without its flavor. Jesus does not like lukewarmness. We are here to make a difference. Sinners need to be saved, sick people need to be healed, oppressed people need to be delivered, families need to be strengthened–and we are the vessels through whom He wants to work to meet these needs! Lukewarmness makes His power of no effect in us. If you are lukewarm, what is the cure? A rebuke from the Lord, some heartfelt repentance from you, and an intimate relationship with Jesus! The number one reason a believer becomes lukewarm is that he or she loses sight of the ever-present Savior and neglects to commune with Him. Without the consciousness of His presence and personal intimacy, we lose our “fire.” Faith, hope, and love wane in our lives and our ability to bear His fruit and make a difference in this world follows suit. Child of God, never lose sight of this gracious reality–Jesus is present with you always. He knocks throughout the day, trying to get your attention. 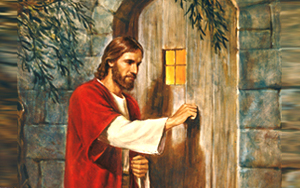 Then, He stands, patiently waiting for your response, hoping you will open the door to Him. You see, He wants to “dine” with you daily. He yearns to enter into deep communion with you, give you His undivided attention, talk with you about your concerns and share His thoughts with you. But He must wait; wait until you are ready; ready to give Him your undivided attention. You don’t have to be lukewarm. The intimacy He offers is possible, but only if you want it. Do you? Then open the door. Great teaching on one of the ways grace works in the life of a believer. I appreciate this interpretation and am aware of it. Mixture can indeed cause lukewarmness, but if you notice the solution Jesus proposed called for them to be zealous, to repent, and open the door to him to dine with them. The solution proposed by Jesus within the context offers a better indication of the cause of lukewarmness among the Laodiceans than the passage you quoted. Furthermore, is it true that a person who does not mix grace and law can not be lukewarm? I have seen too many who are. Thank you Bishop for such a wonderful word. It’s a blessings.